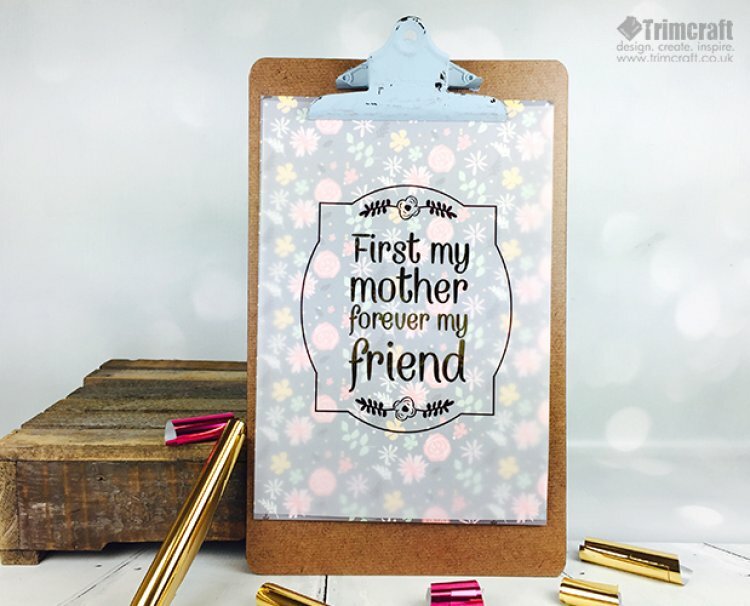 We have designed a free template for you to make your very own multi-coloured foil Mother’s day creation using the First Edition Foil Applicator. What a gorgeous gift it will make and it’s so easy with our simple tutorial. 1.With your laser printer, print the Mother’s Day design in black on an A4 Dovecraft Vellum sheet. Make sure the printer is set to the maximum ink coverage set on the darkest setting. TIP: With our free template, you can modify the size to suit your craft, whether its for a home décor piece or a card design. 2. Pick your First Edition foil, for our design we have used gold for the lettering and pink for the border. Perhaps pick your mum’s favourite colours! Cut your chosen foil for the lettering and only cover the wording. 3. Next, choose your colour foil for the border and cut it to size. Layer on top of your first foil sheet and then, cover both foil sheets with a piece of plain A4 white paper so you can’t see the foil design. 4. Switch on your First Edition Foil Applicator and wait until it is ready. Carefully pass the design through the machine. 5. Once the paper has passed through to the other side of the machine, remove the A4 paper and slowly peel each foil sheet back to reveal your finished design. TIP: it’s handy to hold onto any foil leftovers as they are great to use with the foam and glue. 6. Take your chosen design from the 12x12 Simply Creative Folk Song paper pad and place it behind your foil make. This will make a sweet background for your creation. This is a fun craft project to do as it isn’t time consuming and the finished product is so pretty. If you want to take it one step further, you could add a selection of charming embellishments to the front of your design before you frame it! Don’t forget to upload your Mother’s day inspired foil makes on the project gallery.